Writer and critic Tom Dyckhoff and designer Adam Nathaniel Furman were among those who took to social media to criticise Hudson Yards' stipulations. Vessel is "not what public space should be"
Architect Mark Owen of London practice POW also replied: "But it isn't a public space is it?! It's a shiny attraction to get people into the place to buy overpriced coffee from commercial units?!" Furman posted his comment on 18 March 2019, along with a screenshot of clause nine, titled Content, from the online terms and conditions page. This outlined "irrevocable, unrestricted, worldwide, perpetual, royalty-free, sub licensable and transferable right and license to use, display, reproduce, perform, transmit, publish and distribute such photographs, audio recordings, or video footage for any purpose whatsoever in any and all media". The details now appear to have been adapted into clauses seven and eight, called Notice of Filming and Recording, and My Social Media Posts. The latter confirms that any images posted to social media belong to Vessel, without any "compensation" for the photographer. Photos published to social sites, like Instagram, are typically considered public property. Notice of Filming and Recording authorises the company to photograph or video visitors, with permission to "store the Recordings on a database and transfer the Recording to third parties in conjunction with security and marketing procedures undertaken by Company". 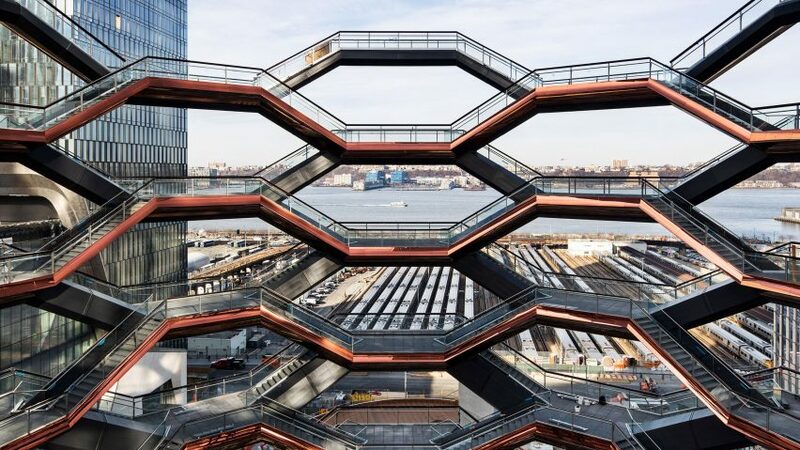 Heatherwick's huge structure of interconnected stair flights and 80 landings sits at the heart of Hudson Yards – the largest private development in the US. Due to be renamed following a public competition, Vessel opened with the rest of the plaza and gardens, and the retail and entertainment provision that make up the mega development's first phase. Much anticipation surrounded the project's completion, however Alan G Brake described it as "a billionaire's fantasy of the future of city life" in an Opinion column for Dezeen.